Extend the life of your hair colour with Clairol permanent Root Touch-Up hair dye. Root Touch Up gives your hair colour a mid dying cycle boost, covering roots and greys when used between regular colourings. The targeted Root Crème works in just 10 minutes and with a blend of tones, matches leading shades, even salon colour. 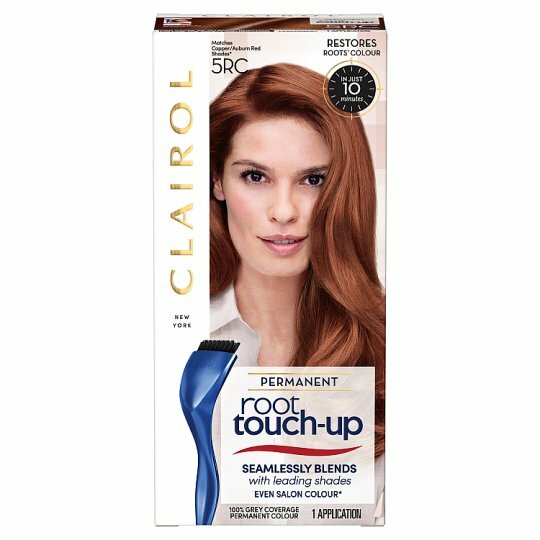 * With a colour suitable for you, Clairol Root Touch Up 5RC Copper Red Hair Dye, you can ensure your roots are never on show. Make use of the included precision brush and easily banish your root line with permanent colour. (*Among leading retail permanent shades and pre-formulated salon colour). ALWAYS READ THE SAFETY INSTRUCTIONS AND FOLLOW THE DIRECTIONS FOR USE CAREFULLY. IMPORTANT: This is not intended for use on persons under the age of 16. Caution: Hair colourants can cause severe allergic reactions. TEMPORARY “BLACK HENNA” TATTOOS MAY INCREASE YOUR RISK OF ALLERGY. To reduce your risk follow these instructions. Do not colour your hair if: You have a rash on your face or sensitive, irritated and damaged scalp You have ever experienced any reaction after colouring your hair Keep the empty carton and the instruction leaflet in case you experience a reaction. Special Cautions: This product contains ingredients including hydrogen peroxide, which may cause severe eye irritation and possible permanent eye injury. If the product gets into your eye, flush immediately with a large amount of lukewarm water and seek medical advice. Avoid contact with eyes. Rinse eyes immediately if product comes into contact with them. We recommend removing contact lenses before applying hair colour. If you must wear contact lenses during application and any products gets into your eye, remove the contact lens first, then flush immediately with a large amount of lukewarm water and seek medical advice. Do not use if your scalp is irritated or injured. Do not inhale or ingest product. Prepare and use the product in a well-ventilated area. If you experience inhalation difficulties, move to fresh air. Wear suitable gloves. Avoid unnecessary skin contact. Do not exceed the development time stated. Rinse hair well after application. Immediately rinse any colour splashes on the skin and clothing. Keep developer away from heat and light. Do not mix this colourant with any other product. Do not leave the mixture in a closed bottle (bottle may expand/burst), if a bottle is used for mixing. Do not keep any unused product. Do not perm, relax or straighten the hair immediately before or after colouring. Do not use when the hair has previously been coloured with henna or metal dyes. Remove all metal objects from hair before colouring and keep them away during colouring. Do not use metal bowl/stirrer for mixing. Heavy sweating may cause bleeding of colourant and staining of textiles. Do not use to dye eyelashes or eyebrows.